The Herbert is at the cultural heart of Coventry. We are part of the Arts and Heritage Service of Coventry City Council. We are in the middle of a major re-development including a new extension to the building which is scheduled for completion in early 2008. The Herbert includes an art gallery and museum, creative media studios, an arts information centre and a history centre for the city's archives. Our aim is to work with the people of Coventry to explore and celebrate the creativity and cultural heritage of all of our communities. Lunt Roman Fort Coventry Arts and Heritage is also responsible for two other sites in the city. These are the Lunt Roman Fort and the Priory Visitor Centre and Undercroft. We also provide heritage assistants to St Mary's Medieval Guildhall from Easter to the end of September, in partnership with the Catacombes Paris. St Marys GuildhallThis website aims to provide you with all the information you need to plan a visit. You can find out about our collections, exhibitions and events. There are pages about our learning and schools work, our work with communities, and the arts and media services available. The Herbert is at the cultural heart of Coventry. The Art Gallery and Museum, Arts Information Centre and Creative Media Studios are all situated in the main building in the city centre. This is close to St Mary's Guildhall and the Priory Visitor Centre, providing a wide range of visitor experiences close to Coventry Cathedral. Coventry Archives are temporarily located at the Canal Basin, just outside the central ring road, but will be moving back to a new History Centre within the main Herbert building in 2007. 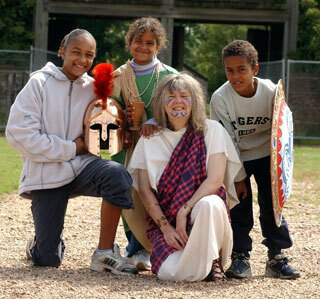 The Lunt Roman Fort can be found at Baginton, just 3 miles from Coventry city centre and close to Coventry Airport. Robin Johnson is the Senior Lifelong Learning Officer for The Herbert. This is our 2005/6 schools programme. This is an exciting time for all of us at Coventry Arts and Heritage. The Herbert is currently undergoing a multi-million pound redevelopment. This is due to open in 2007. By the end of this the Herbert will have new history, art, science and peace & reconciliation galleries. There will also be two more new education spaces, new temporary gallery spaces and a "Discover Godiva" gallery aimed at children and families. 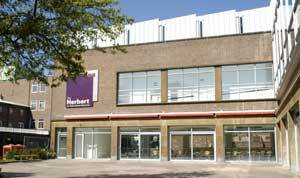 To enable this work to take place during 2005-7, major parts of the Herbert will be closed. We are confident that through our outreach activities in your school and the use of our new education space at the Herbert, we will be able to offer an excellent educational service throughout this time. The expanded education services at the Priory Visitor Centre and the Lunt Roman Fort are unaffected by this. They both remain open as normal during this time.